Perfect for a fideua, Spanish rice, and all your Spanish cooking. These Noras have been cleaned, dried, chopped and packed in a convenient glass spice shaker. The Nora pepper adds an earthy, smoked flavor with just a hint of natural sweetness, to whatever dish you sprinkle it in. Related to the bell pepper, they have next to no heat, but are just bursting with color and flavor. 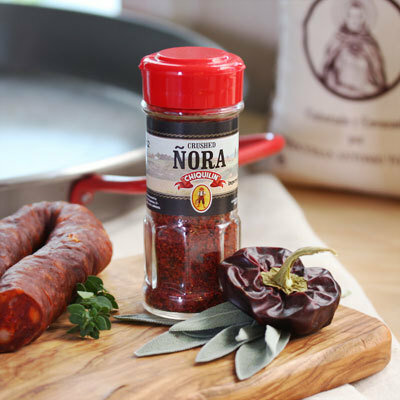 Nora's are one of the most prevalent spices in Spain, often used in soups, stews, paella, seafood, and meat dishes. • Sprinkle in paella or fidua, or even add a little together with a pinch of salt when making regular rice in the rice cooker. The Noras will add a wonderful bouquet of color and flavor to your dish. • Use for making the traditional Bacalao a la Vizcaina, or get creative and use it as a fish-rub before baking or grilling. • Get inspired and add to mashed potatoes, polenta, scrambled eggs, or even mix with cream cheese to liven things up.